Recently I was asked as to why I was not available on IM or other forms on online social communication mediums, during the work hours. My initial response of “it’s distracting from work” was not met with any understanding. I have thought of quoting a good practice of checking one’s email when one has time for it, not have it pop up on screen, as to not break the zen like state of programming. It soon became apparent that I simply had a different perception of what “work” is. Jessica Hagy of Indexed has put things into a nice perspective. Though it seems that not everybody is as fortunate, and it appears to be especially bad for many students. Lacking experience and educational credentials, there is little room to be picky about jobs. Some companies worsen the problem by advertising positions through Universities, but are really looking for cheap, disposable labour. Last year I met 4 students from my University (Mechanical and Mechatronics Engineering) who all worked on synchronizing AutoCAD drawings with database data – apparently it’s cheaper to hire a bunch of students than to invest into a piece of software that does the same thing. In the above example, the guys got as much Facebook experience as they did of technical AutoCAD. Alright, I can see them wasting the day away, chatting to other bored students who don’t particularly care for their Quality Assurance tasks. Clearly they are in the wrong field. You’ve got to do what you love. Now that I’m here, I can continue on improving my salary with more experience, finishing my undergraduate degree in Computer Science, etc – though not at the expense of enjoyment of what I do. I suppose everything has its price, but I will not cross to the left of the Professional-Amateur line. So that’s why I am not on MSN or Facebook during the day – it’s distracting from what I want to be doing. I might check Digg’s technology/programming sections though. So where do you find yourself on the graph, and how do you plan on getting to where you want to be instead? Reply with a comment! I totally agree. It’s hilarious that people ask why you don’t use MSN or facebook AT WORK!! With programming, you definitely have to get “in the zone” and not be interrupted, although, sometimes it helps me to take a break, read digg a bit, and then restart fresh. People underestimate how important it is to enjoy what you do at work, I think. In my opinion, people will always do the best at what they really like the most. It’s scary to read stuff like this and then really, really think about it. Why? Because I think I’m just left of smack dab in the middle of that graph and I’m prety sure I was slipping to the left as well. Since making the choice to leave my current job it’s been as if a huge weight has been lifted from my shoulders (cliched I know) and now it is so much easier to deal with. I hadn’t realized how soul-crushingly depressed I was until I made that choice either. The signs were all there. I’d would have MSN up when I was at work, and Outlook, and RSS Bandit. I would sit sometimes and stare at the clock in the system tray just waiting for some application to “toast” and provide me with a welcome distraction from dealing with my job tasks. If it didn’t happen quickly enough I’d just go WILFing through google. That’s not fair on me or the clients I worked with. And it certainly isn’t fair for my employer. Now that I’ve made the choice, I’m more productive at work, I’m participating in some online communities (like this one), my blog is active again, and I’m researching technologies and techniques which interest me. I’m even thinkin about writing an article or two. Perhaps even more important, my family has me back again. I’m slowly becoming the fun-loving guy I was when I first got married and had kids. I haven’t been him for nearly a year. Nice to know he wasn’t dead. 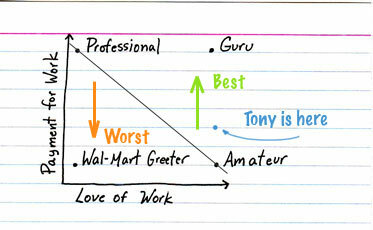 I used to be a complete Amateur at the time I graduated, that is to the extreme X-axis. However, unfortunately with work environment, and life responsibility when you have a family, it’s currently only the y-axis, which is really sad. What I figured out is, at least here in Kuwait and most Arab countries, if you really want to do the correct thing, work hard and do your best, you will be swimming against the current. My objective now is to find a job with short working hours, no on call or late nights of work, the focus on my free time to learn, work, enjoy and do freelance online business. My last 1 month leave I started enjoying working again, I was working on my own. so by doing this, hopefully, i will get the dot in the middle of the two axis. @Andrew – breaks are certainly important, but having “new message” flash in the background will encourage those “breaks” to be every 30 seconds. Personally, I get some coffee or just walk outside for a bit – get fresh air and reset for the next task. You sound like a real douche bag. I think it may be just because you haven’t had enuf live experience….one day you will see the truth, work is a scam, everyone is trying to rob you of your youth. I hope you remember this post, when you realize that. @Mike – I’ll keep this for reference, though it seems that your point is way off. If your “youth” is defined as getting away with the bare minimum required – well I’ve said this already, you’re in the wrong field of work. If I wasn’t working, I’d be doing the same thing anyways. I suppose the trick is being good enough at what you do, to get paid. One could also win a lottery. It’s not the work necessarily, its the overhead. Management or Sales people will eventually wear you down. They have a whole separate agenda that doesn’t involve a zen state of programming. @Mike – I don’t find that at all. I work with Corporate Communications Consultants, done Sales and also a little Management. The real trick is to find something you like doing and then find some sucker who wants to pay you to do it. If you find that you have Sales or Management people with different agendas wearing you down, find a different team, or better yet a much MUCH smaller one. If you find yourself working in a team of five people total, you should have a very different experience. If you can’t find a team like this, start one. I’m sure you have smart friends with grand ideas. Right now we live in a world absolutely filled with potential for young talented groups of people. Super-saturated in fact. The trick isn’t to have the best idea, or even to be the first to market. The trick is to be the first to hit the front page of digg. We work in one of the only environments where the entire industry is literally at our fingertips. If these tips don’t do it for you, try Sales or Management. Seriously! Or try customer training. Or UI design. Or anything else. Get outside your comfort zone. If you can’t get the coding zen you wish to reach at work, don’t try. Do something else and then create a great Open Source project when you get home. Mike M. has posted an excellent response, I don’t have much more to add to that. Just confirming (from experience) that smaller, self-contained, teams have much better communication and offer politics-free work environment that facilitate both productivity and enjoyment. It also tends to pay less but you need to decide what it is that you actually want.